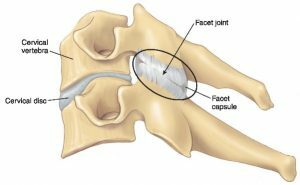 What Is Facet Joint Syndrome and What Are My Treatment Options? Each of the vertebrae in our vertebral column is an irregular bone with a complex structure. The largest part of the vertebrae is the body and are generally cylindrical in shape. They do have slightly different shapes depending on the area of the back and progress from smaller to larger as you go from head to hips. 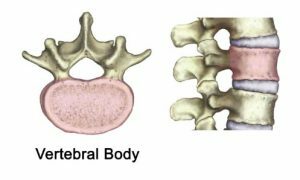 The ventral surface (toward the inside of the body) of the vertebral body is typically convex from side to side and the bodies of the lumbar vertebrae show a significant trend toward lowering and broadening with age. Hence, the reason you find increased lower back pain with age. The superior (top) and inferior (bottom) surfaces of a typical vertebral body are nearly flat or slightly concave. This is where they meet the intervertebral discs. The intravertebral discs make up about ¼ of the length of our spinal column. They are composed of specialized fibers and cartilage (B) and are located between each vertebra (except between C1 and C2 and the Coccyx). The discs allow for movement of the spinal column, but at the same time act as cushions and protect the vertebrae, the brain and other structures (e.g., nerves) from damage during this movement. They do not have a blood supply of their own and depend on the end plates of the vertebrae to deliver nutrients. These end plates are located on the top and bottom surfaces of the vertebral body (A). 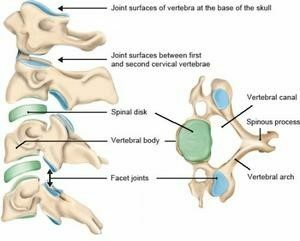 The facet joints are small, cartilage-lined points of contact where each individual vertebra meets the one above and below it. They make your back flexible and enable you to bend and twist, but at the same time limit its range of motion. This mechanism is in place to prevent excessive motion, over-twisting, or toppling over. A healthy facet joint has cartilage, which allows your vertebrae to move smoothly against each other without grinding. However, if the cartilage wears and becomes thin, pain can occur in these areas. Pain associated with the facet joints can be experienced in any section of you back and with each area, you might experience slightly different symptoms. When it comes to treatment options for facet joint pain they range from conservative to alternative, to invasive. It is best to start conservatively and add options as you go along to improve your pain and mobility. Conservative treatment could be as simple as learning or participating in exercises to increase your core strength and improve your posture (e.g., yoga, Pilates, water aerobics, or dance). Others might include massage therapy alone or paired with trigger point release or myofascial release. A mild over the counter pain reliever can help as well. Yoga– Holding different yoga positions can tone and strengthen the muscles in your neck, back and core, all of which work together to keep your spine in proper alignment and proper posture. Exercises included in yoga can increase flexibility. Stretching elongates the spine and temporarily takes pressure off compressed joints and nerves. Deep and rhythmic breathing can be a viable method for relieving tension and reducing back discomfort. Pilates– The goal of Pilates is to lengthen and stretch all the major muscle groups in the body in a balanced fashion. It improves flexibility, strength, balance and body awareness. It increased muscle strength and tone, particularly of your abdominal muscles, lower back, hips, and buttocks (the ‘core muscles’ of your body). Water Aerobics– A water workout is a low-impact activity that conditions and strengthens muscles, helping you better support your spine. And unlike land exercises, working out in a pool provides your body with a “cushion” (the water), which takes stress off your back and helps you move more freely, minimizing your risk of injury. Dance– Movement through dance is an important part of pain relief for a number of reasons. It helps to keep muscles toned and joints lubricated. It encourages the release of endorphins, the body’s natural painkillers. Another benefit of movement that should not be discounted is that it reduces the feeling of limitation that often comes with chronic pain. Alternative treatment is more hands-on by a licensed professional and includes spinal manipulation (chiropractic care), dry needling, and acupuncture. As part of the evaluation, the medical care provider may request that x-rays be performed to evaluate the area(s) where you are experiencing pain. Spinal Manipulation– Many chiropractors will use a technique called flexion distraction to relieve facet joint pain. The goal of this is to decompress the spine by applying gentle stretching or traction to the spine. This painless non-invasive procedure is performed using a special treatment table that allows the practitioner to gently stretch and bend the back in various directions while he/she adds gentle pressure to different parts of the spine (no jerking movements). Dry Needling– This technique, also known as myofascial trigger point dry needling, is an advanced technique for trigger point release. Trigger points are tight bands of muscle fibers, which can be very sensitive to touch and compression. During the dry needling treatment, needles are slowly inserted into the tight muscle, gently manipulated, and removed after a short period of time, and repeated in other muscles on different parts of the body if needed. The goal of dry needling is to create what is known as a muscle twitch response. Acupuncture– It is the ancient Chinese practice of relieving ailments by placing fine needles into strategic locations in the body. Many people worldwide have found that acupuncture offers pain relief associated with facet joint problems. When an acupuncturist stimulates specific points, parts of the nervous system react to relieve pain. Acupuncture is also said to release opioid-like chemicals in your body that can help to relieve pain. It also causes your body to release neurotransmitters that shut off your receptors to pain. If pain persists without relief from through conservative and alternative measures, further evaluation may be necessary. Your care provider may request an MRI in order to get a more detailed “picture” of what is going on. The advantage of an MRI over x-rays is that the MRI shows the detail of structures (e.g., soft tissue damage, tears in cartilage and ligaments, discs abnormalities, tumors, and bone infections) that a normal cannot detect. Invasive treatments should always be your last resort unless necessary to correct a deformity or an abnormality due to an injury (trauma). This level of treatment also has its own pro and cons. You should always be informed about the treatment/procedure and understand the benefits as well as the possible complication before agreeing. This type of treatment may include facet joint injections, radiofrequency ablation (RFA), or facet fusion. 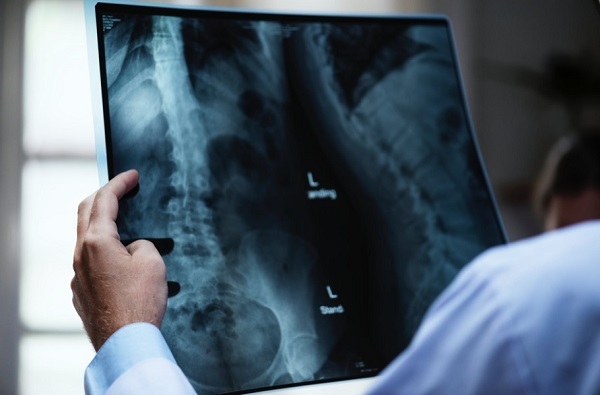 Facet Joint Injections– This is a type of spinal injections that is performed using fluoroscopy (x-ray guided), to ensure that the proper area (joint) is being targeted and that the injection is performed safely. It is done this way to avoid injury or injection into adjacent nerves, blood vessels, and the spinal cord. The injection includes a small amount of local anesthetic (numbing) and/or steroid medication. The effects of the anesthetic are temporary (a few hours) and the steroid may take 5-7 days to begin to work. This is a temporary “fix” for the pain and may need to be repeated. Radiofrequency Ablation (RFA)– The goal of radiofrequency ablation is to provide long-term relief of joint mediated pain that steroid injections cannot provide. It is a multi-step procedure that can be quite painful. The final procedure involves the application of an electrical current produced by a radio wave to the identified nerves. This current is used to heat up a small area of nerve tissue, thereby decreasing pain signals from that specific area. Facet Fusion– This is used when the conservative methods have failed or are not a viable solution. Axial fusion is done by making a small incision next to the vertebrae and creating a channel used to access the affected area between the vertebrae. The surgeon then removes the damaged portions of the disc and replaces them with bone graft material. They will also fuse the discs to stabilize that area of the spine. This fusion stops any movement in the area and can eliminate the source of pain caused by degeneration of trauma. The ultimate goal of facet joint syndrome treatment is to regain full motion and commence strengthening or other exercises to prevent a future, recurrence. Everyone is slightly different, so your treatment will vary depending on what deficits your medical practitioner has found during your examination and treatments. want to read “Healing Back Pain” by John Sarno, M.D or you can contact Michael Sinel, M.D.